Many years ago the Lions club were asked to look after the markets. From those humble beginnings come the most successful markets in the region. Each month thousands of people make this a stop on the coast to enjoy a great day out. Apart from an occasional weather event the day is generally superb. 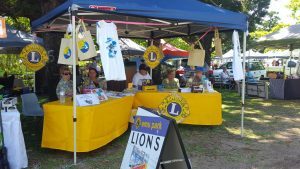 Years ago one of the members felt that to have a stall at each market might encourage people from the community to seek information about the activities the Lions are involved with and perhaps even consider getting involved. This has been a great success with this being the first point of contact. Many times people who were members of Lions clubs in other areas would drop in and say hello. Some even accepted invitations to the next social meeting. After quite a few years at the main entry the information stall has been moved to a different area. Now the participating members can enjoy the music and are close to the food stalls. This means an increased amount of visitors and the members can enjoy an informal get together each month. One of our new members, Sandi has taken over the stall from Rob. She has spruced the stall with a woman’s touch and made the stall fantastic. The last two markets are concentrating on the famous Lions Christmas cakes and this year a beaut cake in a great cake tin. These have been selling fast so don’t put off getting one of these. There are even small “Smoko” sized cakes that you can buy to enjoy with your coffee from a market vendor. Please drop us a line if you want to share compliments, praise, accolades or even contribute an article for inclusion in our news pages.